Cole Younger was born in Harrisonville, Jackson County, Missouri on 15th January, 1844. The Younger family supported the Confederate Army during the American Civil War. In 1862 William Quantrill established a band of guerilla fighters. 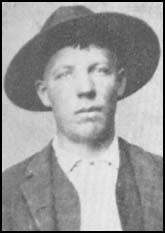 Cole Younger joined and other members of the gang included Jessie James, Frank James and James Younger. As well as attacking Union troops the Quantrill Raiders also robbed mail coaches, murdered supporters of Abraham Lincoln and persecuted communities in Missouri and Kansas that Quantrill considered to be anti-Confederate. The gang also gained a reputation for murdering members of the Union Army that the gang had taken prisoner. On 21st August, 1863, the Quantrill Raiders committed one of the worst atrocities of the Civil War when it attacked the town of Lawrence. During the raid Quantrill's gang killed 150 inhabitants and set fire to over 180 buildings. After the war Cole Younger and his brothers Bob Younger and James Younger became outlaws. They joined a gang that included Jessie James, Frank James, Bill Chadwell, Clell Miller and Charlie Pitts. In 1866 Younger had a relationship with Belle Starr. She gave birth to a daughter, Pearl, but it is unclear who was the father of the child. On 13th February, 1866, the James gang robbed a bank at Liberty, Missouri. Over the next few years the Younger brothers took part in twelve bank robberies, seven train robberies, four stagecoach robberies and various other criminal acts. During these crimes at least eleven citizens were killed by the gang. As well as their home state of Missouri they were also active in West Virginia, Alabama, Arkansas, Iowa, Kansas and Minnesota. On 7th September, 1876, the gang attempted to rob the First National Bank in Northfield, Minnesota. During the raid one of the gang shot and killed the cashier, Lee Heywood. Members of the town decided to fight back and they opened fire on the gang. Bill Chadwell, Clell Miller and Charlie Pitts were killed whereas Cole Younger, Bob Younger and James Younger were all wounded and captured. Younger was found guilty of murder and robbery and was sentenced to life imprisonment. Cole Younger was released from prison on 10th July, 1901. He tried to make a living from lectures such as 'Crime Does Not Play' and 'What Life Has Taught Me' and appearing in Wild West Shows. He also wrote his autobiography, The Story of Cole Younger. Cole Younger died on 21st March, 1916.